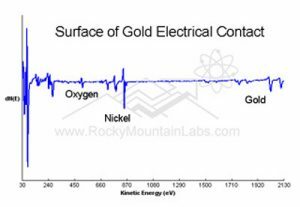 Auger Electron Spectroscopy - Chemical Analysis In Golden | Rocky Mountain Laboratories, Inc.
Auger Analysis, Auger Electron Spectroscopy (AES or Auger) is a chemical surface analysis method. AES measures the chemical composition of the outermost 100 Å of a sample. Measurements can be made at greater depths by ion sputter etching to remove surface layers. All elements except for H and He can be detected at concentrations above 0.1 to 1.0 atom %, depending on the element. 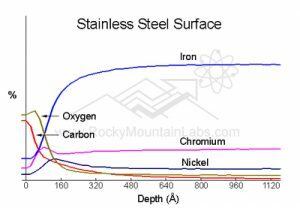 In addition, elemental concentration versus depth (up to 2 µm) information can be obtained by ion sputter etching while monitoring every element of interest. Only conductive samples can be measured with this technique. The sampled area varies from 1 mm down to 2 µm in diameter. Auger Electron Spectroscopy (AES Analysis), also referred to as Scanning Auger Microscopy (SAM), uses a focused electron beam to create Auger electrons near the surface of a solid sample. These electrons have energies characteristic of the elements and, in some cases, chemical bonding of the atoms in the sample. AES can provide elemental maps, and when combined with sputtering, gives elemental and chemical information as a function of depth (depth profiling). Due to the nature of the Auger electron emission process, AES can detect all elements except H and He. It is usually nondestructive, except when depth profiling. Concentrations as low as 0.1 atom% can be detected. 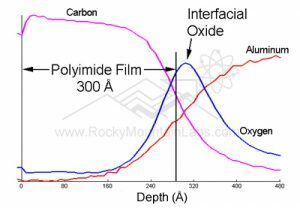 The sampling depth is 15-30 monolayers (50-100Å) and it can distinguish features as small as 0.1 µm, AES dos elemental analysis of unknown conductive materials well. Our Physical Electronics Mode 610 Scanning Auger Microprobe provides scanning Auger microscopy (SAM), Auger electron spectroscopy (AES), and secondary ion mass spectrometry (SIMS). The system uses AES to perform compositional analysis and compositional depth profiling of selected elements by recording the Auger intensities as a function of energy or sputtering time, respectively. SAM uses AES in a raster scanning mode to provide an image of the lateral distribution of elements on the sample surface. SIMS detects secondary ions sputtered from the surface to identify elements or molecular species by their mass-to-charge rations. SIMS analyses can be performed in either static or dynamic mode. The Model 610 is often used in cases where fine x-y spatial resolution (300Å) is needed. The Model 610 can operate at lower current levels than other electron beam instruments. This is advantageous when analyzing nonconductive samples. Additionally, the system has EBIC (electron beam induced current), EBIV (electron beam induced voltage) and AVC (Auger voltage contrast) functions for performing microelectrical analysis. An Auger line scan shows the relative concentration of a specific element along a line across the specimen. The electron beam is stepped point-by-point along a selected line. The Auger peak height and background level are measured and the difference stored. The system can scan up to five vertical or horizontal lines and will monitor up to ten elements per line in a single sequence. Stored data can be printed or superimposed on a photomicrograph. Line scans can also be corrected for topography using a special computer algorithm. An Auger image, or elemental map, shows the surface distribution of an element. An elemental map is obtained by setting the analyzer to a specific Auger peak energy and scanning the electron beam over the selected sample area point-by-point. The peak intensity above the adjacent background at each point is measured and stored for later output. The matrix size a s specified by the operator can be up to 250 lines with up to 250 points per line. The stored image can be photographed with a 4-to 256-level gray-scale format or a pseudo-color format. Auger line-shape analysis involves the resolution of observed changes in KVV, LVV, MVV, NVV Auger transitions due to different chemical environments in a material. AES data is recorded in N(E) mode and corrected for secondary electron background as well as inelastic backscatter. Curve fitting is then accomplished by using a weighted-least-squares fit of a Gaussian function to the data values by means of stepwise Gauss-Newton iterations. A Gaussian fit to the actual data is used since the data are taken in a pulse count mode and the pulse-height distribution is Gaussian. In most cases, theoretical Auger line shapes are used as models for the curve fit parameters. Auger voltage contrast (AVC) involves the measurement of energy shifts (about 0.5 eV) of Auger transitions associated with an internal potential at a p-n junctions. A narrow energy window is set on the slow-energy slope of an Auger peak while the electron beam is scanned across the sample in the Auger compositional mapping mode. The small energy differences are measured and displayed as a surface potential map of the p-n junction. This technique requires an angle lapped surface to be useful.